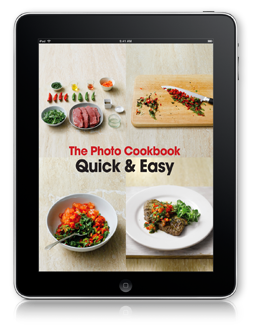 The Photo Cookbook is like a private cooking course in your own kitchen with an experienced cook, who clarifies the preparation. Beautiful photography, which is displayed in high resolution especially on your iPad, illustrates every step. prepare – many can be made in just minutes! Every recipe starts with a photograph of all the ingredients. This is more than just a pretty picture or – even less helpful – a montage that is not to scale, so that a chili appears to be the same size as a whole fish. Instead, it serves as a handy way of checking that you have everything ready before you start cooking. those with more experience will find it a helpful reminder of the little touches that can easily be overlooked. Each recipe ends with a lovely photograph of the finished dish, complete with any serving suggestions. The basic version of the app illustrates 84 recipes, divided into four topics: “Quick & Easy” (60 recipes), “Asian” (5 recipes), “Italian” (15 recipes) and “Baking” (4 recipes). By In-App-Purchase, you can increase your library to 240 total recipes (that’s 60 recipes per chapter). Each topic is divided into four chapters, within which the recipes are displayed in an overview. Every chapter scrolls vertically, so that you can play with your choices and visually decide which recipe you really want to prepare. also compatible with iPhone and iPod touch based on popular demand from our customers. Frame by Frame – Quick & Easy (Parragon Books Ltd, 2010).